So a while back Trey Causey of Sorcerer's Skull Released "Strange Stars" a " setting for any game where modern transhuman science fiction meets classic 70s space opera." It was a pretty good all purpose supplement about a very "Star Wars" (or perhaps more "Ice Pirates") meets Ian Banks' Culture Novels or Lecke's Ancillary universe and it was followed shortly by a FATE mechanics book for the setting written by John Till. 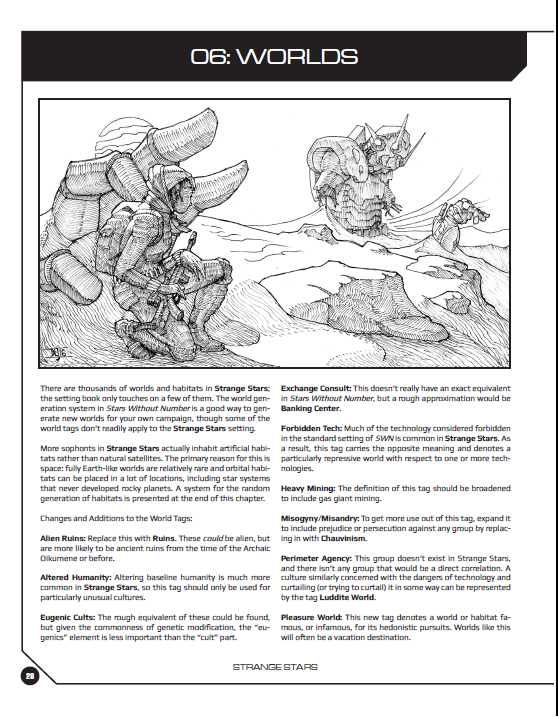 I know nothing about FATE so I can't comment on that one, but recently Trey and Hydra Cooperative put out Strange Stars OSR. I think I know OSR and I even know Stars Without Numbers, which is a slightly crunchy (Optional DM facing crunch - it's fine) version of space Dungeons & Dragons using the contentions of the 1980's Basic & Expert books ('B/X' or Red and Blue Box). I also know Trey, in an internet acquaintance way, and think he's one of the best people working in the OSR gaming scene (though I don't think he'd consider himself OSR exactly, even if I think he's running a Wizard of OZesque 5e campaign or maybe a B/X Planet of the Apes game these days), who doesn't get nearly the credit he deserves. Not only is Mr. Causey's blog always updating with something interesting to say (though often about comics or sci-fi movies, and usually fairly short), but it has been for years. Mr. Causey's earlier works regarding "The City" are a phenomenal setting that was one of the early departures in the tabletop revival blogging scene from vintage rules recreation. "The City" is detailed in "Weird Adventures" and is a 1920's weird fantasy New York attached to a Weird fantasy America and world. It is amazingly well done, pulling from a rich well of popular culture and geek culture to create a truly inspiring and darkly humorous setting. The folks at Hydra Cooperative are also pretty excellent, and produce high quality works, so I have a great deal of fondness for both author and publisher - but still I bought this PDF ($5.55) with my own money and so I promise to be critical of it where it's deserved. So Strange Stars OSR is a 37 page PDF with a functional but bare bones presentation - it's simply a scan of the setting book. For use "at the table" I'd love a PDF that had tables and such linked from the text or contained a solidly linked together index, but I don't find anything wrong with the way it's presented, it's just not using the PDF format optimally. 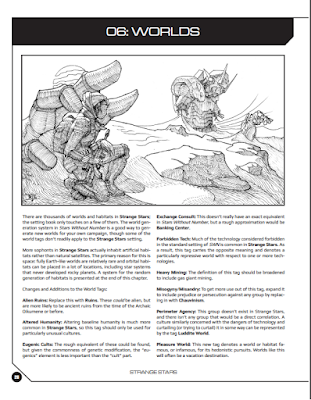 As always with Causey's work it's well laid out and there is plenty of art in Strange Stars OSR. It's good art, though less common then in the Strange Stars setting book, which has art on every page. Some pieces are repeated from the setting book itself, but most is new and drawn by talented and familiar names such as Jez Gordan and Jason Sholtis. The book itself is a bit odd, a setting book that augments a larger and entirely systemless setting book with light mechanics and references to a set of existing system books (the basic versions of which are free - so that helps). It's a bit hard for me to place and I can't help but think that an omnibus of Strange Stars and Strange Star OSR (or presumably Strange Stars Fate) might be more efficient with space. Yet that's not to say Strange Stars OSR is dry or repetitive, it's less a mechanics pamphlet/overlay for a setting then it is additional setting content with mechanical notes. The free version of Stars Without Numbers is almost entirely setting free, so I guess the best way to look at Strange Stars OSR is as an alternative setting section for it to create a more Vernor Venge type universe with a strong side of 70's space pulp. The book beings with a list of potential races - it's rather long and covers most of the basis, murderous cat people, a variety of engineering stereotypes, bird-people, and space hippies. That is to say the sorts of Star Wars or Star Trek style aliens that represent human virtues and failings in a comical or symbolic manner. Yet, like much of Strange Stars, underneath the almost obvious higher level setting elements there's great bits of evocative detail. For example the first 'baseline human' culture mentioned the "kauth" are your typical brawny space barbarians from a primitive world - but they are also servants of biotechnological sea monsters with a strongly hint at the "Innsmouth Look". There's a lot of fun to be had among Strange Stars available races, but none of them are especially complex, most being simply a base idea, combined with one or maybe two interesting deviations. After the races are a set of new backgrounds more appropriate to the transhuman sci-fi of Strange Stars then the baseline space opera of Stars Without Numbers. Following these character generation elements is a fair amount of setting information aimed squarely at a prospective GM. It reminds, cajoles and explains why trans-human space and technology might change the way one plays a game: how ever present data (and spam) overlays might change room description, how fabrication and post scarcity societies might work with a XP for GP type mechanic and how space travel functions in Strange Stars. These elements as well as the "Setting Conventions" section are very useful and I think something that writer of non-standard table-top settings should emulate. It is more of a help to a would be GM to explain setting conventions and 'rules' then to provide mechanical detail or even a pile of new monsters, because setting conventions can help fill in the gaps that will always appear in one's tabletop game. Beyond this there are some useful ideas about regions of space (with references to appropriate media influences) and a truly excellent hook generator which leads to things like "The party must hunt a convicted megacorp executive on an Aurogav Starliner but will contend with identity theft and hacked accounts (or some kind of ancient bio-weapon known as a 'Hellhound' - it depends)". There's a set of monsters, which often have that distinct Strange Stars feel of being what one would expect from popular scifi/geek culture but with a really amusing, fun and gameable twist. Beyond that a simple atlas of planets and regions with gameable ideas placed in the fore, a random habitat generator and a list of factions done in the Stars Without Number style. All this is rather useful and compressed, without great detail. In general Strange Stars OSR is a very usable product, and it's goal (one I think it meets) is to inspire GM creativity rather then provide a definitive gazetteer of a huge game universe. As mentioned above I enjoy the way that Causey uses the tropes and cliches of popular science fiction (both the older sources and newer transhuman sci-fi), but mixes them up in evocative ways. This helps overcome one of the issues with unique setting, as there are still solid shared references for the players and GM that allow a more intuitive understanding of the setting, but with tropes crossbreeding, inverted or askew there's an unpredictability that appears as uniqueness or novelty. Unfortunately Strange Stars OSR often feels like only part of a setting book, and it is, but this can be jarring - much content both mechanical and fictional refers to either Strange Stars (the main book) or Stars Without Numbers. To some extent this is forgivable, but it makes Strange Stars OSR a supplement to a supplement and while it's a fun read as a stand alone product, and very useful for actually running Strange Stars as a Stars Without Numbers Setting, it has a somewhat incomplete feeling on its own. Again I think this is unavoidable, but I wish this product was combined with Strange Stars as it would create something far more seamless. Other then this structural issue Strange Stars OSR is a great product, fun, approachable and sometimes surprising, and one I would recommend if you've already purchased Strange Stars and wants to run it using Stars Without Number (or a similar B/X derived system perhaps). Thanks for the review. To your main criticism, I wish they were combined. The reason they aren't is purely cost. Really that's my only criticism, and the cost bit makes sense. Perhaps a deal bundle with both in the future (and maybe SWN). will there be a omnibus box set once the movie comes out? Is that Fin Fan Foom in the second illustration?